There's nothing like a good ol flash mob to advertise your product. This has certainly been done in the past, but in the instance of the company in question (T-Mobile), this is the second time they have pulled this stunt...to my knowledge that is. As much as I hate the coverage T-Mobile provides here in the U.S., this was very well done. I love this type of advertising because people leave with a lasting memory, compared to remembering what happened in a brief 20 second spot. Integrate your product with the customer and if done well, will leave you with much more than any other kind of traditional advertising can provide you with. The best part about this form of advertising is that no matter what you do, the sheer size of pulling this off, will ultimately result in random people recording it through their phones and posting it instantly on the web, which will get shared over and over and over again, resulting in free advertising. 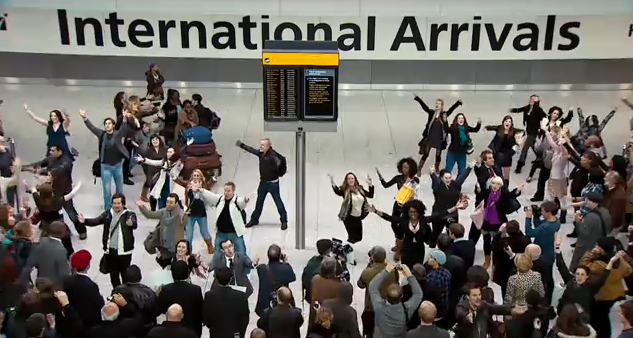 The video you are about to see, was shot at Heathrow Airport. I've been in Heathrow a few times and would have loved to have been greeted by this and then found out my luggage was missing, rather than just finding out my luggage got lost somewhere. Oh well, you can't everything! Anyways, check it out, and let me know what you thought!! Enjoy.